SAN FRANCISCO--(BUSINESS WIRE)--Sep. 20, 2017-- Visa (NYSE:V) today announced its global Team Visa roster for the Olympic and Paralympic Winter Games PyeongChang 2018, comprised of over 40 Olympians and Paralympians from 17 countries, including Mikaela Shiffrin (USA), Chloe Kim (USA), Mark McMorris (Canada), Gus Kenworthy (USA), Oksana Masters (USA), Lee, Sang Hwa (South Korea), Kamil Stoch (Poland), and Hilary Knight (USA). 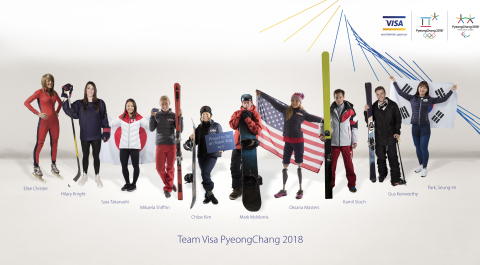 This team of Olympic and Paralympic hopefuls represent a diverse group of individuals representing a range of sports, from snowboarding and speed skating to ski jumping and figure skating. A global Olympic partner for more than 30 years and Paralympic partner since 2003, Visa founded its Team Visa program in 2000, with the aim of providing athletes with the tools, resources and support they need to achieve their lifelong dreams, both on and off the field of competition, regardless of their origin or background. Today, Team Visa is unified by athletes who embody Visa’s values of acceptance, partnership and inclusion, with athletic talent matched equally by their character. Mikaela Shiffrin (USA, Alpine Skiing): After making history at the Olympic Winter Games Sochi 2014 as the youngest American to win Olympic Gold in Slalom, Mikaela is looking to solidify her place in Olympic Winter Games history by winning more Olympic medals than any other female alpine skier. During PyeongChang 2018, she is determined to compete in four individual events and the team competition. Chloe Kim (USA, Snowboard – Halfpipe): As a 13 year-old, Chloe qualified for the Olympic Winter Games Sochi 2014 and would have been a favorite to win Gold, but by rule was too young to compete. At the Olympic Winter Games PyeongChang 2018, as a first generation Korean American, Chloe is looking to win her first Olympic Gold medal in her parents’ home country. The Southern Californian teen has quickly become the sport’s biggest star aiming to make her Olympic Winter Games mark in PyeongChang. Mark McMorris (Canada, Snowboard – Slopestyle & Big Air): After a near-fatal crash in back-country British Columbia in March 2017, Mark’s determination to reach the top of the podium at PyeongChang 2018 is what is fueling his recovery to push himself beyond the limits. Given that he won bronze at Sochi 2014 just two weeks after suffering a fractured rib, Mark is determined to defy the odds once again at the Olympic Winter Games, and bring home Gold in the inaugural big air event – arguably his best event. Gus Kenworthy (USA, Freestyle Skiing – Slopestyle & Halfpipe): As the first openly gay action sports athlete, Gus is a trailblazer on and off the slopes. In his Olympic Winter Games debut in Sochi 2014, Gus earned a Silver medal in the inaugural slopestyle event, and has his sights set on reaching the podium in both slopestyle & halfpipe at PyeongChang 2018. Off the slopes, Gus is a major advocate for the LGBTQ community, hoping to inspire others to be confident and open about their sexuality. Lee, Sang Hwa (South Korea, Speed Skating): As a two-time Gold medalist, Lee, Sang Hwa is always pushing past her own limits on and off the ice. She was inspired to skate by her brother, but her parents could only afford to support one child in pursuit of the Olympic Winter Games dream, driving her to work harder to push past her personal boundaries. In 2018, Sang Hwa hopes to do what only one other Olympian has done – win a Gold medal in three consecutive Olympic Winter Games. With PyeongChang 2018 being held on her own turf, she is inspired more than ever to reach the top of the podium. Kamil Stoch (Poland, Ski Jumping): Born and raised in Zakopane, a Polish ski resort, Kamil Stoch learned to ski when he was three years old, and started jumping just one year later. By the time he was sixteen, Stoch made his World Cup debut and two years later he competed in his first Olympic Winter Games. At Sochi 2014, Stoch won two individual Golds, making him the third ski jumper in history to win both individual events. Oksana Masters (USA, Para cross-country skiing & Para biathlon): Oksana was born with complications that later were linked to nuclear radiation exposure and she was given up for adoption at a Ukrainian orphanage. Needless to say, the now three-time Paralympian has been defying all odds since birth. Oksana has three Paralympic medals under her belt (2 Bronze and 1 Silver), and is hungry for her first Gold at PyeongChang 2018. She’s also hoping to make history. After missing the medal podium by 3 seconds in 2014, Oksana is aiming to be the first US athlete at the Olympic or Paralympic Winter Games to medal in Biathlon. Hilary Knight (USA, Ice Hockey): Hilary was a member of the United States Women’s Ice Hockey Team that won Silver medals at the Olympic Winter Games Sochi 2014 and Vancouver 2010, and is hoping to bring home her first Gold at PyeongChang 2018. Off the ice, Hilary is a leading advocate in the fight for equal compensation for female ice hockey players and also made history in 2014 when she became the first female skater (non-goalie) to practice with an NHL team. For additional information on Team Visa, follow along at @VisaNews on Twitter and visit www.visa.com.